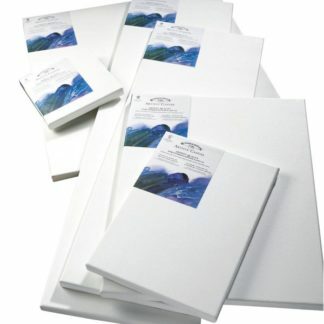 This artists’ quality canvas range consists of carefully selected and prepared stretched cotton canvas to ensure outstanding quality. This range is now more comprehensive than ever before and is ideal for all techniques including heavier application of colour. Triple coated with two coats of highly pigmented primer and one coat of acid free sizing – all formulated by Winsor & Newton. Artists’ Canvas also offers balanced absorbency and tooth, essential for preventing the sinking of oil colour; this also means that the canvas has improved adhesion. 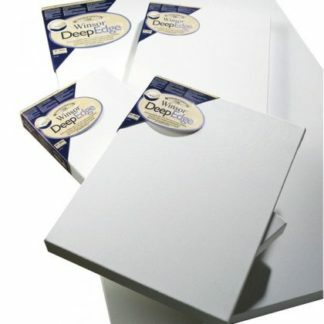 All Artists’ Canvas is stapled on the reverse resulting in clean edges, to ensure that you can paint on all four sides. Professional stretcher bars are as standard and offer great strength and stability. Staples are on the back for for mounting unframed if desired. Available in standard or Deep Edge. Please note that all Winsor & Newton canvases are supplied with wedges. Wedges are used to expand the stretcher if the canvas slackens in adverse weather conditions. Wedges should be placed in the corners and tapped in with a pin hammer. The use of wedges is not a common requirement.